Player 1 sprints and picks up the basketball from the 4 chairs on the court, making posts from alternative positions. 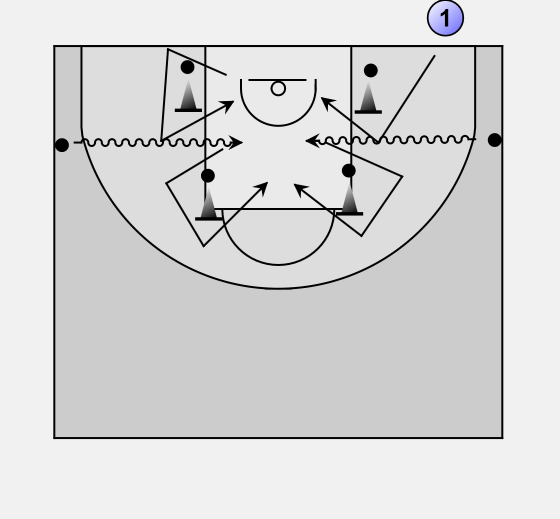 After shooting the 4 shots, player 1 then sprints to the sideline and picks up the basketball, power dribbles (crab dribbles) it to the middle of the key and shoot a hook shot, then sprints to the other sideline to pick the other basketball up and repeat the dribble and shot. Although this drill is a hustle drill, player 1 should look to make their shots.